Now in its sixth year, the 16 day celebration will descend upon the city from Saturday 31 October through to Sunday 15 November 2015 and, with the support of Scotland’s Year of Food and Drink, promises fun, entertainment, inspiration and curiosity for all ages in the shape of over 40 events. As the countdown begins, the festival programme was launched today in the presence of Superman, Spiderman and Frankenstein! Once again, the emphasis will be on free (and discounted) events, with the majority taking place within Dundee Science Centre, as well as community venues and shopping centres, not forgetting a standalone programme of events within primary and secondary schools. Day one of Dundee Science Festival will kick off with Halloween special ‘Superheroes V Monsters’ where families can join Igor and his superhero friends for a day of science experiments, feverish face painting, super powers and monstrous mask-making. 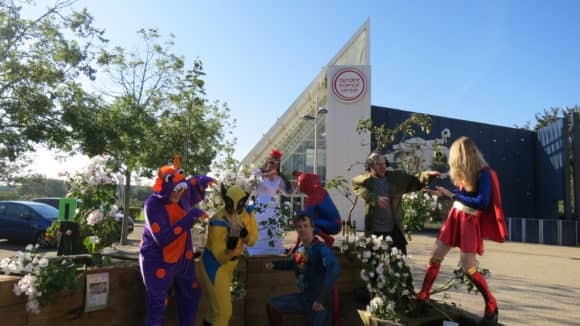 Visitors to this Dundee Science Centre event can also delve into the science behind superpowers, explore monster myths and fully embrace the wonderful world of good vs evil! In the evening, adults will also get the chance to explore the science of the paranormal. Marking Scotland’s Year of Food and Drink, the festival will also feature a pop-up food market showcasing local produce. Further events include an evening dedicated to video games, an outdoor ‘Big Bang’ event celebrating the history of fireworks, and a ‘Curious Creatures’ event with a collection of animal guests lined up, from cuddly guide dog puppies to scaly lizards. To ensure that no-one misses out, a number of events will be held in community venues and shopping centres, where visitors can try their hand at everything from jewellery-making and forensics to exploring the night skies and making brush robots. A programme of free, evening lectures will also be held at Dundee Science Centre throughout the duration of the festival, with topics as diverse as human performance doping and fracking. Dundee Science Centre, along with Abertay University, will be coordinating the schools programme, which will see a number of events for primary and secondary schools in Dundee. Jim Clarkson, VisitScotland Regional Partnerships Director added, “Dundee Science Festival is always a highlight of the local events’ calendar and the addition of a culinary Year of Food and Drink element to this science spectacular will bring a delicious new flavour to this year’s festivities. Dundee Science Festival is brought to you by Dundee Science Centre, along with key partners Dundee City Council and Scottish Government with additional support, as part of Scotland’s Year of Food and Drink 2015, from VisitScotland. For more information, and to view the programme in full, please visit www.dundeesciencefestival.org or follow Dundee Science Festival on social media – www.facebook.com/dundeescifest (Facebook) or @dundeescifest (Twitter).